Asia’s leading music festival returns for the seventh year with some of the biggest Asian artistes of the moment scheduled to perform in Singapore on 21 November 2015. 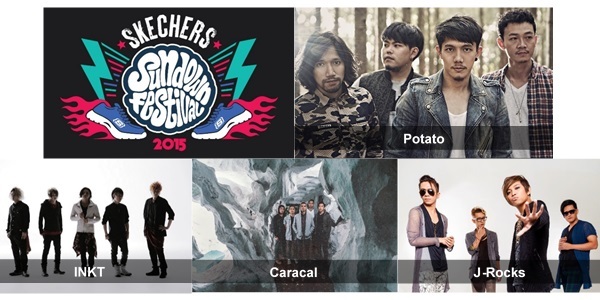 Featuring artistes from around Asia, Thailand’s ‘Potato’, Japan’s ‘INKT’, Singapore’s ‘Caracal’ and Indonesia’s ‘J-Rocks’ are the initial line-up of headline acts scheduled to rock it out at the Skechers Sundown Festival 2015, with amazing artistes from Korea joining the ranks soon. Staying true to its mission, of uniting Asia through music as well as creating a platform for local talents to showcase their skills, the Festival will also feature fringe acts comprising up and coming artistes. Homegrown Singaporean musicians ‘Cheryl Loon’, ‘Cashew Chemists’ and ‘Farrago’ are some of the exciting artistes performing this year, with special guests ‘Ground Zero’ from Taiwan! “Skechers has a long history working with global music artistes. We’re excited to be presenting the Festival once more to show our support towards the progress of Asian music, giving a platform to Asian musicians to showcase their unique sounds,” said Susan Chua, Vice President, Skechers ASEAN. The iconic Skechers Sundown Festival is held each year at the Marina Promenade, F1 Pit Area, bringing one singular platform to bridge Asian artistes, fans and diverse Asian cultures through music and food. Since its first showcase in 2009, the festival has now grown to more than three times in audience size. Tickets (Early Bird @ $68, Category 2 General Admission @ $88; Category 1 Mosh Pit @ $118) go on sale from 18 September 2015 onwards. For more information of the festival, please visit Sundown Festival’s Facebook page at www.facebook.com/mysundownfestival.